I never remember much of my childhood as a matter of course. It takes a catalyst to pry-bar and lift the layers upon layers of dusty cobwebs, deep into my psyche, to pull something from my past. Not surprising, considering my obsession with food, its usually an odor, a combination of flavors, a texture. Tangy, garlicky, creamy…I’m transported back in my Sunday church clothes in the spring to after-church dinners at the Georgian Oaks on the Old Four Lane – and their creamy garlic salad dressing on iceberg lettuce… And then I can think about Easter Egg hunts, Sunday drives in the family car look at all the Dogwood Trees down Ponce de Leon, playing for hours in the freshwater spring in our back yard with water so cold it would numb your feet until you felt like you were walking around on nubs. Stale cigarettes, A1, french dressing, french fries and something on a grill – and I’m back at Buddy’s Steak House on Roswell Street… and my first steak eaten out at a restaurant. and from there to piling us all in our jammies and going to the Drive-In theater – the back of the country Squire carpeted with pillows and sofa cushions. I don’t think I ever stayed awake to see the end of any movie. Chili powder and burnt ground beef – I’m at Hunt’s Restaurant on Atlanta Road eating a chili dog with my grandmother… to weekends at her house, picking beans and shucking corn into dampening paper bags until my fingers puckered. Corn meal frying in the spring air – it can only be the Rio Vista Catfish Restaurant… and the All-You-Can-Eat catfish dinner… to my granddad’s birthday. Every May, when I was a wee boy (less than 10, I guess), my dad’s family got together on or around May 18th for my Granddad’s birthday dinner. It was one of the few occasions we all got together to eat. And, Every year it was at the Rio Vista. Plates upon plates of fried whole catfish, mounds of crispy hush-puppies with just a touch of onion, plates of hot steamy fries and Cole slaw. 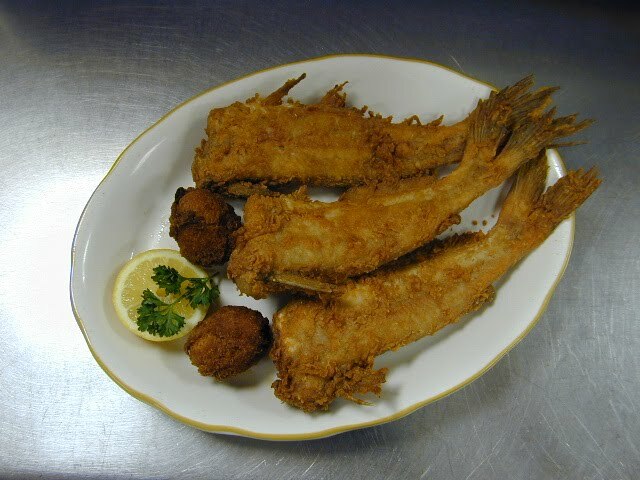 There were usually around 30 of us – we’d get a back room at the restaurant and the staff would parade never-ending platters of perfectly cornmealed and fried whole catfish, so crispy so crunchy, you could even eat the tail and fins. I’ve never understood the fascination with sauteed and blackened catfish fillets or nuggets. Catfish to me, is about the size of your hand, whole – bone in – and fried -fins and all. Its crispy, crunchy, and the meat is flaky, white and perfectly steamy. What about the bones? Honestly, half the fun is getting the fish off the string of bones – sliding your fork in – just right – so that you can lift it off without breaking the meat for that one perfect mouthful of catfish. Why the Catfish story? Today – we’re doing a catfish dinner. So, get your fryers ready. Drain on paper towels and repeat until all the fish is fried. 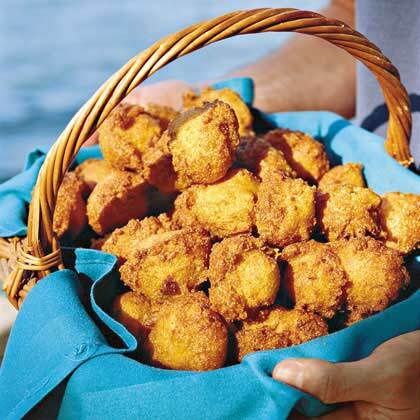 Hush Puppies – The Best Hush Puppy you’ll ever eat! The Key to making light airy, NON-Greasy puppies is not to let the mixture sit before frying – so get your fryer ready before you start to mix the batter. Don’t fry more than 6 at a time – you want them to fry without being crowded, and too many in the oil at one time will lower your frying temperature and your puppies will be greasier. Add the mayonnaise 1/4 cup at a time. – the vinegar and seasonings will leach a little juice out of the vegetables. Do not let the slaw dressing get over watery – so cut back on the mayo if you have a lot of juice in the bowl when you get ready to mix. 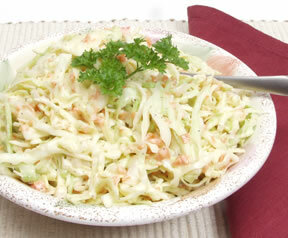 Refrigerate and let the slaw sit for at least an hour before serving. Nothing goes with hot, fresh catfish than freshly made Tartar Sauce.